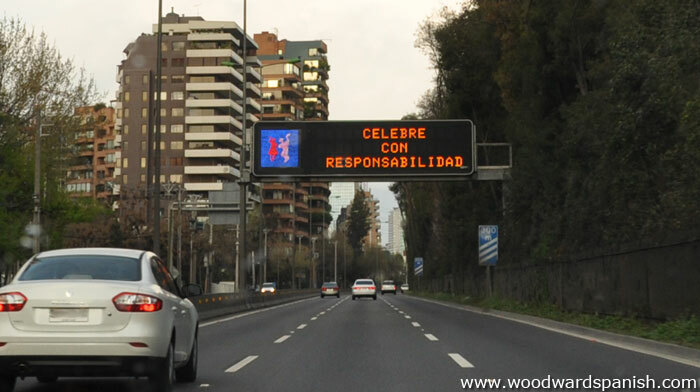 Notice how the verb “celebre” ends in an E even though celebrar is an –AR verb. That is because the verb is in the imperativo (imperative) form. Remember that this conjugation is often used to give orders or instructions. In the case of this photo you are “instructed” to celebrate in a responsible way. Notice how many words in Spanish that end in –idad and similar to words that end in –ity in English. This photo was taken during the Fiestas Patrias de Chile. You can just make out the image of a couple dancing the cueca, Chile’s national dance.